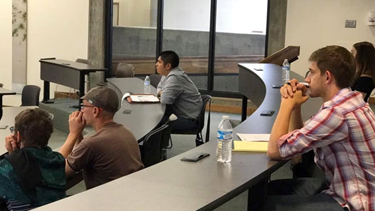 Students interested in attending law school intently listen to presentations given by David Pallozzi, Cory Munoz and Nancy Huffstutler. 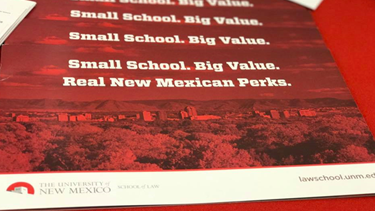 Last week, The UNM School of Law hosted an Open House to prospective students and applicants. The Open House consisted of presentations on the admissions process, requirements, financial aid, and student services. It also featured a panel where current students discussed what their experience has been like so far in law school. The law school generally holds an Open House each season, with anywhere from 20-40 prospective students attending. David Pallozzi, Director of Admissions and Financial Aid says that the Open Houses are always a great opportunity to meet new faces. The law school holds an Open House each season, with the next occurring in the fall. The UNM Law School will host another Open House will be in the fall. For more information on the admissions process or future Open Houses at the law school, visit our Application Timeline on our website or our Facebook Page for updates.